Hummus is one of my favorite foods on the planet. I love it! I add it to salads, top it on my homemade burgers, add a dollop to soups, enjoy it veggies, etc! Most days you will find me enjoying this healthy and extremely tasty dip. This particular dip is a nice change to the traditional hummus. Adding the walnuts adds a good source of heart and brain healthy fats. The basil is loaded with nutrition and flavour! Enjoy!! Drain beans, reserving liquid. In food processor, combine ¼ cup reserved liquid with remaining ingredients. Cover and process, scraping down sides and adding liquid as needed to make a smooth mixture. Store in refrigerator for 4-5 days. Serve with raw baby carrots, cucumber sticks, broccoli and fresh string beans (or any raw veggie you like). PLEASE SHARE! I LOVE TO HEAR YOUR COMMENTS AND QUESTIONS! 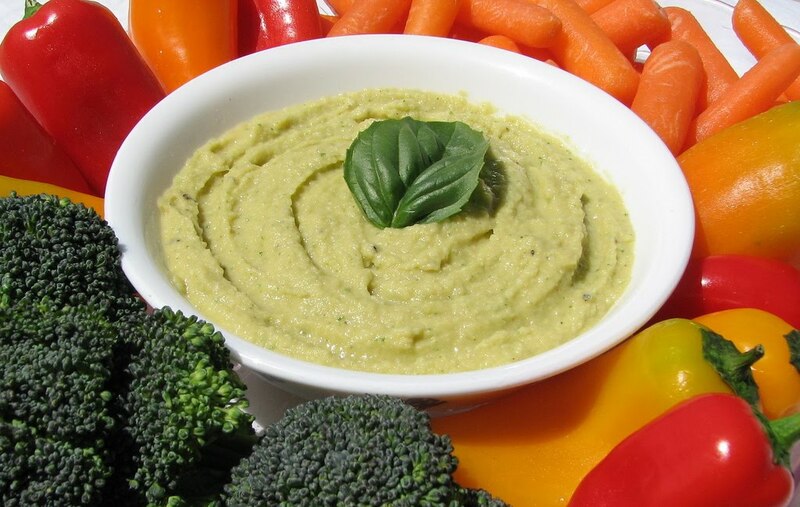 WHAT IS YOUR FAVORITE HEALTHY DIP?? ?